Eargo is a Class I FDA-regulated hearing device designed for adults who experience mild to moderate hearing loss. Invented by an ENT surgeon with more than 30 years’ experience, Eargo earbuds are virtually invisible. They work with patented Flexi Fibers, a soft material that comfortably suspends the device in the ear without blocking natural sound from entering the ear canal. While hearing aids typically amplify sound using a small speaker, the Eargo device allows bass sounds to travel into the ear so only treble sounds need be amplified. 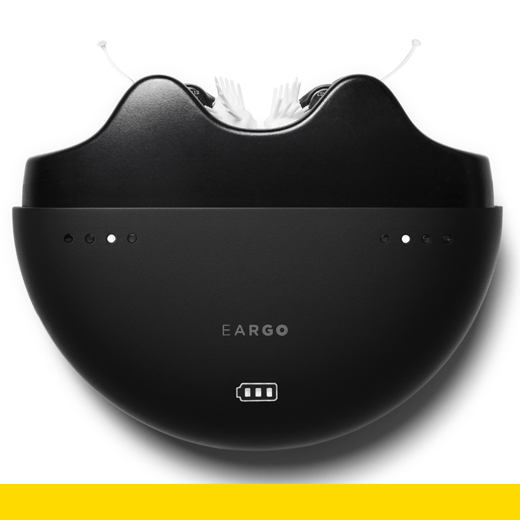 The design language for Eargo was inspired by consumer technology rather than medical devices. It defies the notion that hearing aids can’t be beautiful and desirable. Traditional hearing aids can be frustrating for users, with tiny batteries, screws, and buttons that are nearly impossible for people with low dexterity to use. The portable charger was designed to be discreet and beautiful and to solve battery power, one of the biggest pain points when it comes to hearing aids.